When in 1954 Ray Charles reworked the old gospel spiritual, “Jesus Is All The World To Me,” into the decidedly carnal exaltation of “I Got A Woman,” opponents assailed the song as sacrilegious—the Devil’s music. The song not only sparked the sound we call "soul," but it also foreshadowed on what side of the mortal plane his music would interminably reside. 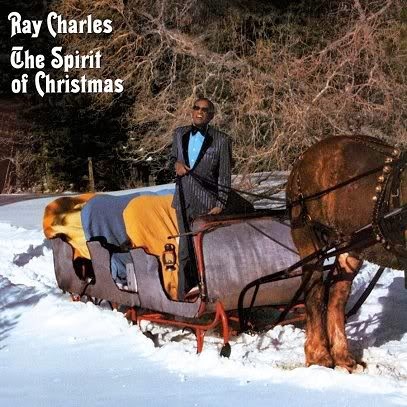 Such is what makes The Spirit of Christmas—originally released in 1985 and reissued earlier this year on Concord Music—a somewhat surprising anomaly in Ray Charles' monumental career. While the Genius doesn’t break creative ground on this, his first and only holiday album—it certainly isn’t a pivotal game changer like Modern Sounds in Country and Western Music—he nevertheless delivers a mostly satisfying set that contains its fair share of highlights and serves its purpose well. Upon a foundation of light, jazz-tinged arrangements, Charles engages these songs with considered renditions, the best of them letting him be himself rather than impressing upon him to conform to any notions of how certain Christmas songs should sound. So while Charles comes across as a bit awkward and out of his element on a hokey version of "Santa Claus Is Coming To Town," on less familiar fare like "This Time of the Year" and "Christmas In My Heart," he's as earnest and soulful as ever. The centerpiece of this collection is "That Spirit of Christmas," in which Charles summons all of the nostalgia and optimism that the holiday season can inspire. It was an instant classic in '85 and hearing it now, twenty-five years later and after the legend's passing, makes it seem all the more so. And the bonus cut of another classic—Ray Charles wooing Betty Carter on the definitive duet of "Baby, It's Cold Outside"—makes this album even more worth owning.